No words. 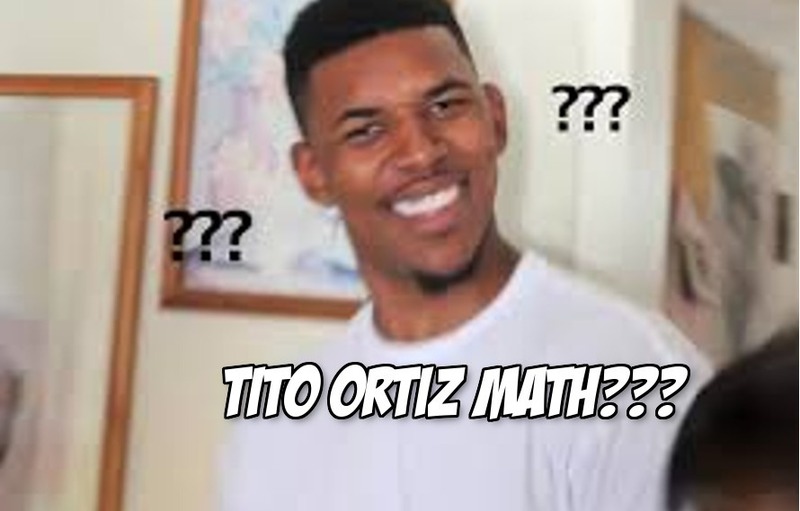 Maybe the best Tito Ortiz quote on mathematics ever. Look man, The Huntington Beach Bad Boy is paid to elbow people in the head, not solve complicated addition equations. When asked about how much he was training for his upcoming third fight with Chuck Liddell, Ortiz had simple answer. Then he gave another answer. Then he added another answer on top of that. And to finish it off, Tito Ortiz threw some more words and numbers in there to wrap it all up in bright orange flaming bow. Ortiz will not color inside of the lines and he will not be confined by the basic rules of numerals. Damn it, when Ortiz plays Jenga he doesn’t use just one set of towering blocks, he throws two more complete sets on top of that sucker just for the challenge. The air up in Big Bear is kind of thin you guys. Cut Ortiz some slack on your so called “rules” about “numbers” and exactly how many days are in a week/hours are in a day. It’s all just relative. So Tito how much are you training for Chuck? There’s just no way Tito Ortiz believes the Earth isn’t flat, right? Scott Steiner just watched this video explanation and quietly nodded in approval. 60% of the time Tito Ortiz’s math checks out all of the time.